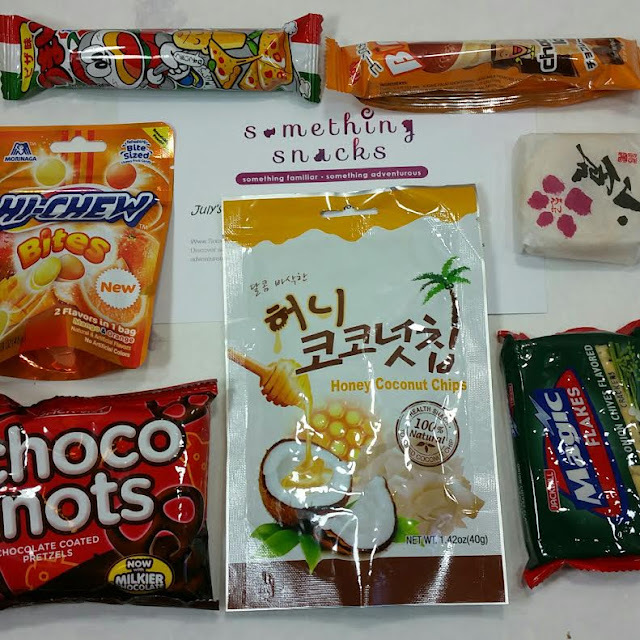 This month, Something Snacks features snacks from all around Asia! 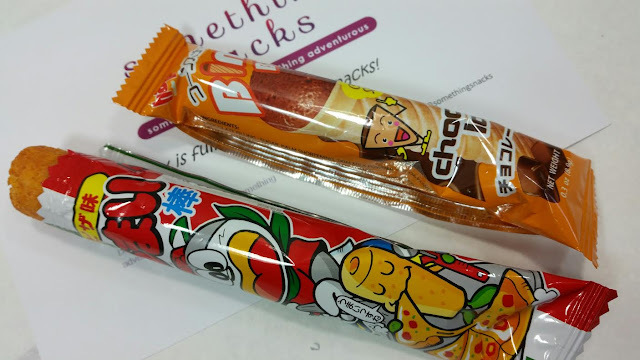 Between my husband and I we are really good at eating all the Japanese and Korean snacks we get! 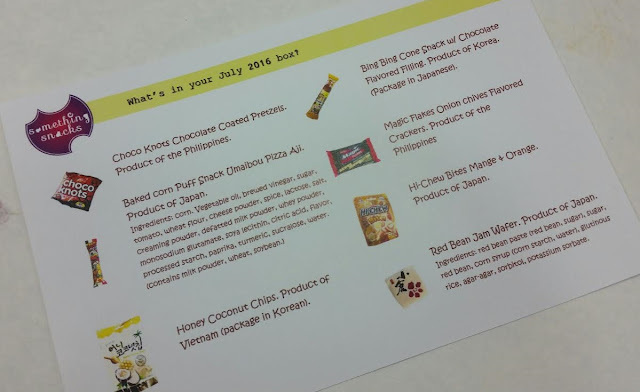 This time around there's also snacks from the Philippines and some of the best coconut awesomeness ever from Vietnam. 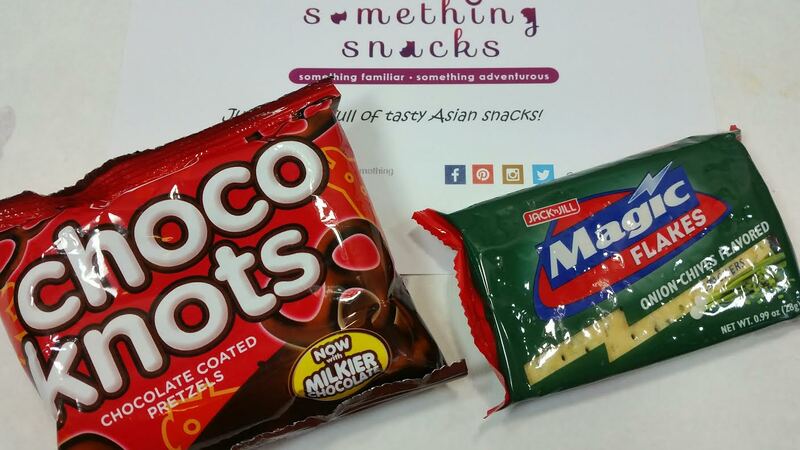 Something Snacks is committed to providing something unusual and something familiar in every box. It's fun because while there are monthly themes, not everything is too weird to eat and there's usually a great mix of sweet and savory. I am always a big fan of a nice balance between the two. Choco Knots- These are chocolate covered pretzels from the Philippines. The brand is Jack n Jill and they've been around since the 70's, famous mostly in the Philippines. Magic Flakes Crackers- I have no idea what is magic or flaky about these. They do taste like chive, though. They remind me of Keebler Clubhouse Crackers (the ones in the green box) but less buttery. Umaibou Pizza- This did not taste like pizza. It tasted almost like spicy tacos. Either way, I'm not sure either thing is too popular in Japan so I can't fault them for not getting the taste perfectly Americanized. Haha! These umaibou are strangely addicting although I think I prefer the onion one. Honey Coconut Chips- This is the best thing in the box! 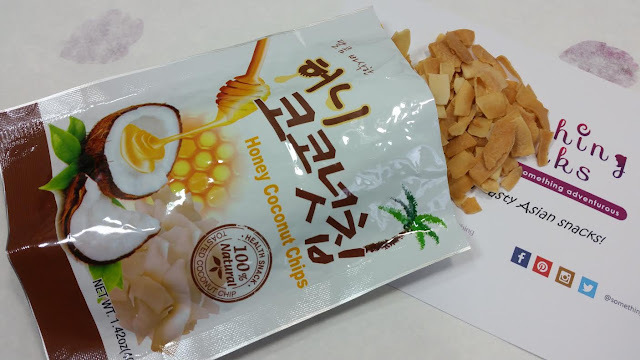 I love coconut and this is toasted with honey. I'm not sure it could get any better than it is! Made in Vietnam. 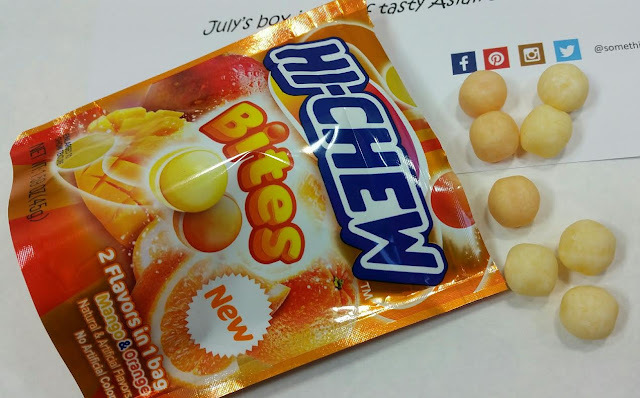 Hi-Chew Bites- I love Hi-chew and I already ate these. They were Mango and Orange flavor and were totally delicious. These are chewy with a hard candy shell and the mango is amaaazing! VERDICT: Something Snacks is a great box if you're looking for snacks that won't gross you out and that aren't just the good-for-you kind. I find it fits in with the "everything in moderation" stance. There's a nice balance in snack flavors and between my husband and I, the snacks never go to waste. If you'd like to sign up for Something Snacks, you can do that here. Use code BITSBOXES2 for $5 off your first box. You'll likely be able to get this exact box if you order before the end of July. Otherwise, you'll get August. The website is usually pretty clear about which one you'll get. What is something you've found in a snack box and desperately needed more of? I have two... Watapachi Melon candy from an international snack box and then lime flavored Tocinetas. While I managed to find the Watapachi Melon, I have never been able to get the lime Tocinetas. They put such nice info cards in the boxes too. I love snacking so boxes like this are perfect for me. I do love dark over milk which makes my mom happy because I just save everything and give it to her.